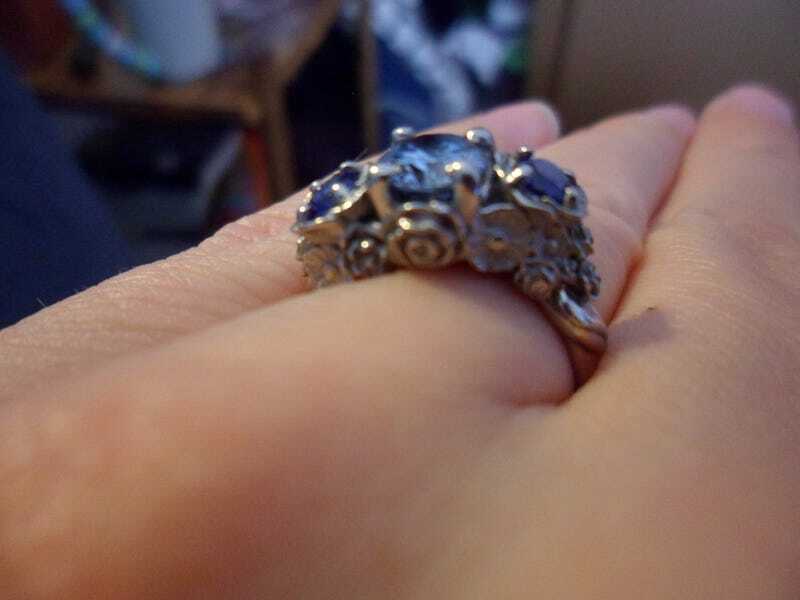 It's not obvious, but the center stone is a blue diamond, and the smaller stones are sapphires. My former boss from when I interned with my sorority's history museum had asked me to help volunteer with last night's ghost tour, and she said that Booo Vierge could come too. So I helped with the tour, and then Booo Vierge asked if I would give him a tour. I thought he was crazy, since I gave him the full tour when we first started dating (July/August 2011), and we took the special Christmas tour last year. But then he said it would be a great excuse to make out in the belvedere (we totally kissed up there after the other tours). I literally gave him a ghost tour of the museum, up to the belvedere. When we got up there, though, I noticed a Harry Potter book on the bench. "Someone left their Harry Potter book up here. That's weird." Then I noticed a Go-Pro on the window. "Someone left their Go-Pro up here. That's weird." SO OBLIVIOUS. Finally he convinced me to open the Harry Potter book, and inside, he had carved out the pages and hidden my ring!!!!!!!!!!! He had arranged the whole thing with my best friend (and former intern, current employee at our sorority's HQ), and she had gotten my former boss to lure me there to volunteer. We walked back downstairs, and my bestie was there with her fiancé (also my best friend) and another good friend of mine (and former roommate)! Plus pink champagne! It's been super-fun telling everyone, and it's SO HARD not announcing it on my blog or twitter. So if you follow my twitter or blog, IT'S A SECRET. I do not want my carefully cultivated anon life to turn into a wedding planning persona. Plus I have a special post planned for the day of our wedding to announce our "lost" PIV virginities. I can't screw that up! But I had to tell GT. It's like a secret layer to my anon life that no one else knows about. Edited to add a "birds-eye view" picture.